The focus for this month’s industry focus is construction. Our employment data for construction are obtained from the Labour Force Survey, which focuses on the St. Catharines-Niagara Census Metropolitan Area (CMA). As a result, these data do not include Grimsby or West Lincoln. For additional information on employment in Grimsby and West Lincoln please review our municipal snapshot documents. Results from the Labour Force Survey indicate that approximately 13,000 individuals residing in Niagara were employed in construction throughout 2017. This puts construction as the 6th largest source of employment for Niagara residents. Figure 1 shows the number of employed individuals in construction. The construction industry saw growth in the number of individuals reporting employment in this sector between 2013 and 2015 but it has been decreasing since 2015. 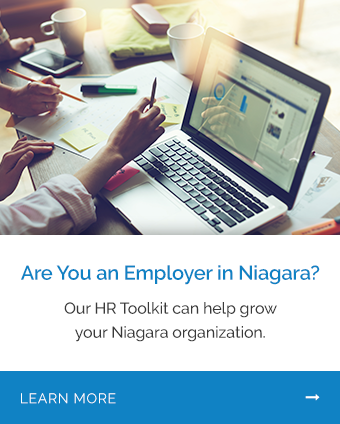 This follows the same general employment trends seen throughout Niagara. Figure 2 shows the percentage of all of Niagara’s employed residents that work in construction. While data from Statistics Canada report on the number of people living in Niagara who work within a given industry, data from Table 1 provide a count of the number of jobs in Niagara in construction. Here, the data are based on the Niagara region and include all 12 local municipalities. Table 1 outlines the number of jobs and average wages per job in construction between 2013 and 2017. Overall, the number of jobs between 2013 and 2017 in Niagara increased by 15.7% or 1,566 jobs. Table 2 dives deeper into construction to provide an outline of the most common occupations within the industry. Together, these data highlight an interesting phenomenon. Data from the Labour Force Survey indicate that the number of individuals living in Niagara that report employment in construction has decreased. However, data from Analyst indicate that the number of jobs in Niagara has increased. The implication here is that although there are fewer residents in St. Catharines-Niagara working in construction, the number of jobs is still growing. It could be that commuter flow data would indicate individuals are commuting to Niagara for construction jobs. Want to know more about in-demand jobs in construction? Contact us.